136-174MHz 512 channel, portable radio with display. Analog, LTR standard. Both LTR® trunking and conventional channels are programmable on a radio. Group, selective (DTMF), and phone call are available in LTR® mode. The Intrinsically safe version is approved by the FM Approvals. For use in workplaces where combustible substances or environments exist. See new brochure for more details. The supplied 2000mAh Li-Ion battery pack, BP-232N, provides 14 hours* of operating time. The optional battery case BP-240 provides a convenient back up and great reassurance in an emergency. Using a large full dot-matrix LCD (32 18 mm), the IC-F3161/D series shows upper and lower case characters clearly. The display setting is selectable from 1 line, 12 characters or 2 lines 24 characters via programming. The bottom row shows assigned functions to the [P0] to [P3] buttons. *Inversion type voice scrambler is not compatible with UT-109/UT-110 voice scrambler. Measurements made in accordance with EIA-152C/204D, TIA-6 for analog. All stated specifications are subject to change without notice or obligation. 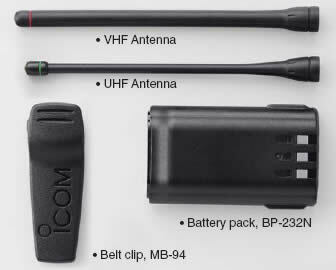 Icom makes rugged products that have been tested to and pased the following MIL-STD requirements and strict environmental standards. Must be used with the BP-232FM battery. The HM-169IS, VS-1SC, HS-94 and HS-97 are approved as instrinsically safe options. Any other options, except the antenna, belt clip and belt hanger, cannot be used in explosive atmosphere areas. Never change the BP-232FM (with/without the transceiver) in an explosive atmosphere. The optional battery chargers are not approved as intrinsically safe. Li-Ion 7.4V/980mAh, Operating time: 7.35* hours. Output power: 5W. * Operating time is approximate time (at 20°C). Tx: Rx: standby=5:5:90. Power save on. Li-Ion 7.4V/2000mAh, Operating time: 14* hours. Output power: 5W. Batteries (LR03) X 6, Output power: 1W. Charges the BP-232N in 10 hours. (approx.). Rapidly charges up to 6 battery packs (Six AD-106s are required). Charging time: 3 hours (approx.) when BP-232N is attached. Bracket firmly holds a single rapid charger to allow battery charging while in a vehicle. The first image depicts the standalone MB130. The two subsequent images portray the bracket holding two different radios / charging cups. For use with the BC-121N. (12-20V DC required). Swivel type. A fast and easy way to remove the transceiver from your belt. Swivel type belt hanger. Swivel joint of the MB-93 supplied. Fixed type belt hanger. For use with MB-94. Rugged type speaker-microphone. Equivalent to IP57. GPS speaker-microphone. Equivalent to IP57. Full size durable speaker microphone with revolving clip. Waterproof GPS speaker mic for EMDC radio versions only. Required when using these headsets with the transceiver. Provides clear audio even in noisy environments. Provides connection for SP-13 EARPHONE. Automatically sends an emergency signal when the transceiver is left in horizontal position for a preset time. 136–174MHz. Cut the antenna element to tune to a specific center frequency. 380–520MHz. Cut the antenna element to tune to a specific center frequency.